Those born between January 29, 1987 and February 16, 1988 are members of the Fire Rabbit Chinese Zodiac sign. RABBIT people are happy, gifted, refined and ambitious. They also know how to draw others’ attention and are great mixers in any social gatherings. The typical Rabbit will be submissive, even humble, in a constant effort to avoid confrontations. Rabbit is an excellent judge of character, with an instinct for recognizing sincerity in others and an almost uncanny ability for sensing falsehood. Hare people make wonderful receptionists, publicists, stockbrokers, and pharmacists. With the passion of the Fire Element, the Fire Rabbit is the most intense and active of all the Rabbit Types. Not suffering from the indecisiveness of most Rabbits, the Fire Rabbit is bold and precise in their action. Taking to the fiery nature of their element, the Fire Rabbit loves adventure and will actively seek out fun, exciting experiences. Luckily, the passion of the Fire Rabbit does not cancel out their sensitivity and emotional intuition, which allows them to be quite charming. These qualities combine to make the Fire Rabbit a natural leader. With those they hold dear, the Fire Rabbit can be affectionate and loving. The charisma and passion of the Fire Rabbit can play a key role in the career success of the Fire Rabbit. As others are glad to follow the Fire Rabbit, those born under the sign may do well in management, business or public relations. On the other hand, the lack of interest in material gain may lead the Fire Rabbit on a life of adventure, possibly as a missionary or following other international humanitarian efforts. The passion of the Fire Rabbit has been known to translate to success in sports. This can be seen in the skill and competitive spirits of Lionel Messi and Tim Tebow, who are both Fire Rabbits born in 1987. The Fire Element puts the Fire Rabbit on a fast-track to success, but it does not come without its downfalls. 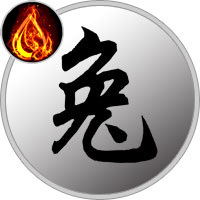 The Fire Rabbit can have more of a temper than any of the members of its sign and can lash out at others when offended. Similarly, the Fire Rabbit can be overly aggressive in situations where they feel threatened. In order to counter these unstable emotional tendencies, the Fire Rabbit is encouraged to develop techniques to curb their anger. Fire adds spark to the Rabbit’s personality and all that Fire Rabbits do. Fire compels Rabbits to seek new adventures. Prone to tantrums, Fire Rabbits prefer to avoid conflict.